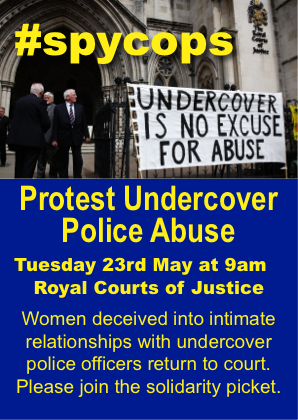 On Tuesday 23rd May, a legal case over undercover police relationships will return to the High Court, following a hearing last year , when police were able to push back disclosure of documents relating to the identity of the officer, his training, deployment and supervision. Two women and one man are suing The Metropolitan Police, South Wales Police and the Association of Chief Police Officers over sexual abuse committed by an undercover police officer in Cardiff – “Marco Jacobs”. The Undercover Officer had spent 5 years infiltrating anti-capitalist, anarchist, environmental, animal rights and other campaign groups, developing a number of close personal relationships, and in common with several other undercover police who have been exposed, engaged in the sexual abuse of a number of his targets. On Tuesday 23rd May at 9am, before the Case Management Hearing, there will be a protest outside the Royal Courts of Justice by the claimants and their supporters.